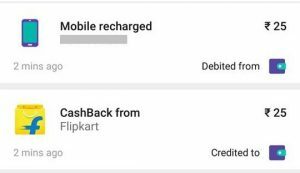 Get 100% Cashback upto Rs 25 on First Ever Mobile Recharge from Flipkart! 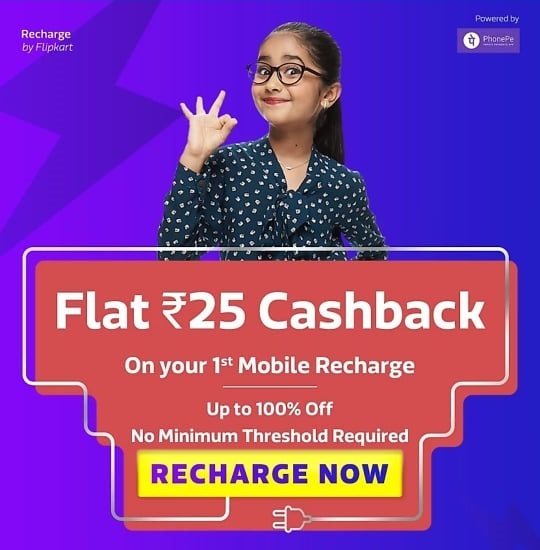 – After Amazon introducing the Recharges, Flipkart is here with the same powered by PhonePe. You can now recharge your mobile numbers from Flipkart through PhonePe. As the introductory offer, you can grab Rs 25 Free Mobile Recharge i.e., Flat 100% Cashback upto Rs 25. So let’s avail this offer. Step 2: Install, Open and Login to your Flipkart Account. Step 3: Now from the top menu or the main menu, select Recharges Option. Step 4: You will see the offer banner and Recharge Button. Just click on RECHARGE NOW button. Step 5: Give the PhonePe Access Permission and then Enter the Mobile Number you want to Recharge. Step 6: Enter amount as Rs 25 or less to grab the full offer benefits. Step 8: As soon as you complete the recharge, 100% Cashback of your Recharge Value will be added to your PhonePe Wallet which you can use for future transactions or withdraw to bank account.